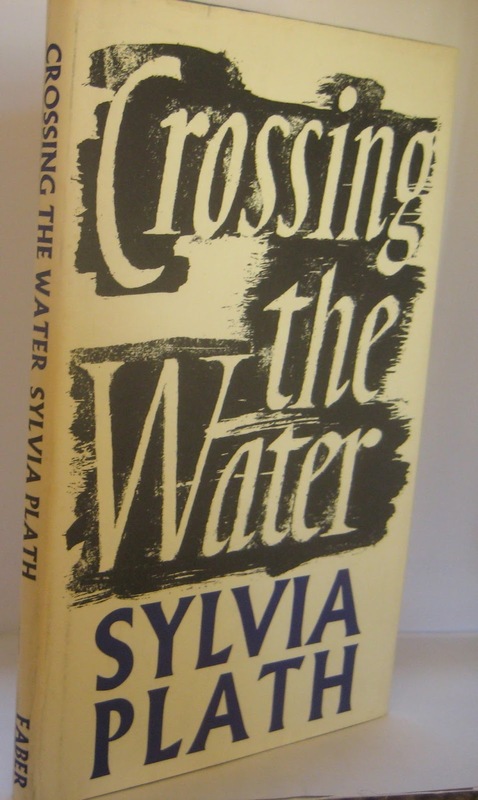 A while back (13 December 2009), I did a post that involved looking at statements or assertions made in Paul Alexander's biography of Sylvia Plath Rough Magic regarding a supposed abortion had by Plath circa September 1955. Since then I have looked some more at Plath's passports, trying to figure out her travel routes and the cities through which she passed - even if only fleetingly in the carriage of train. I started this post in February 2012 and feel like it is time to post it! There are two passports of Plath's. The first she used from 1955 through 1957 is now held by Indiana University; the second was in use from 1959 until 1963 (though the last stamp is from 1961 -- when Plath visited Wales and Ireland in 1962 she did not receive stamps). The second passport is now held by Emory University. As such, I have broken this post up into two parts: the first part (which is part two if you consider the post from 2009 to be part one) will examine Plath's first passport (1955-1957); and the third part, which I will post in April, will look at the second passport. The first passport in particular was difficult to figure out as Plath was quite active once she got to Europe on her Fulbright. Several items below are questionable and I have tried to both list when I am a unsure and also tried to determine a most likely solution. 24 March - 6 April Paris, France (See Plath's Journals, Appendix 7 (pages 552-568) for information about her time in Paris. 6 April: Arrival stamp at Kehl Bahnhof, Germany (11 months later, Plath wrote in her journal on 4 March 1957, "I am angry now because, except for snow, I forget what the trip from France to Munich was like" (273). 6 July: Arrival stamp at (? ), Spain (Irun, Spain is the most likely entry point given it is just across the border from Hendaye, France). In this passport, issued on 29 June 1955 at Washington, D.C., there are five "Permitted to land stamps" done by British Immigration. Four of them give Plath permission to be in the country until 20 September 1956 and one until 20 September 1957. 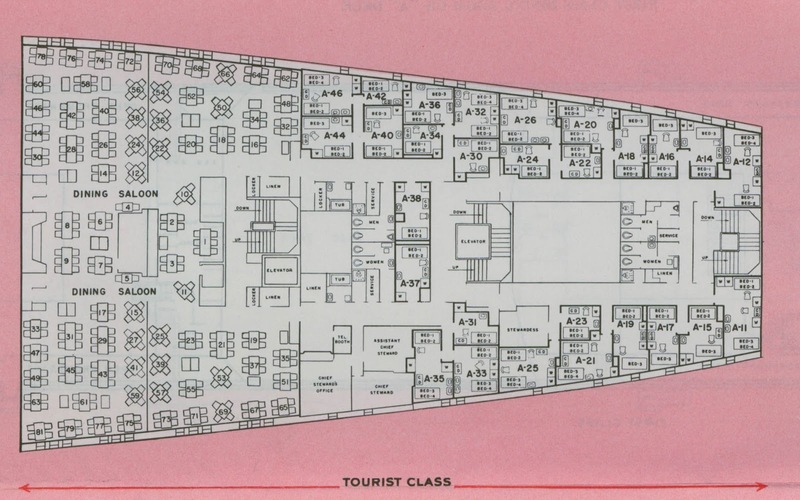 The last one, which changes the language from "permitted to land" to "grant of leave to land" appears to have been dated by the Immigration officer as 10 October 1956. Plath left Paris and traveled to Munich, entering Germany by train at Kehl, just east of Strasbourg. The date stamp on the passport is quite difficult to determine as the stamp did not hit the page evenly, or possibly it was not evenly inked. Plath planned to be in Paris through Easter, which in 1956 fell on 1 April. 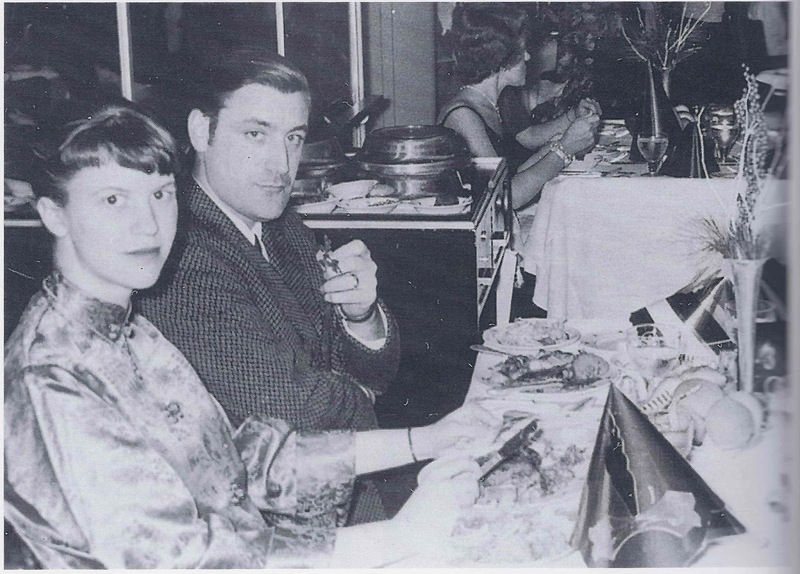 In Rough Magic, Paul Alexander states that Lameyer arrived in Paris on 4 April and that he and Plath left Paris on 6 April. They stayed just the one night in Munich. From Munich, it appears Plath traveled through Kufstein, Austria. She has a stamp in her passport for 7 April 1956. She has another stamp on her passport for that date from Brennero, on the Italian/Austrian border. The "B" in Brennero is on the fold-line between two pages, so it is missing, but a look at a map confirms that Brennero is likely where she crossed countries. So, Plath and Lameyer traveled from Munich to Kufstein through Innsbruck to Brennero to Venice. Between 7 and 13 April she was in Italy in Venice and then Rome, she left Rome on 13 April, her father's birthday. 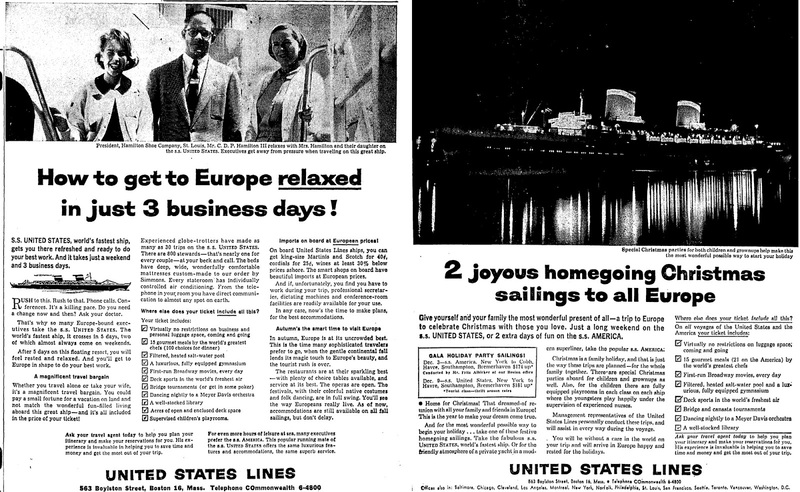 The Lameyer photograph collection at the Lilly Library has some amazing images of Plath from this time in Venice, on a gondola, etc. Some of these have recently been published in Andrew Wilson's book Mad Girl's Love Song: Sylvia Plath and Life Before Ted. All links accessed 25 February 2012 (!!) and 18 March 2014. Over four days in February, from the 8th to the 11th, I conducted a tour to three Americans of Sylvia Plath sites in England. While I have given dozens of tours of Massachusetts Plath-sites to people from the US, Canada, England, Wales, Ireland, Germany, Sweden, and France, this was a first. It was an opportunity that seemed too good to be true: an expenses paid trip to England! To make a long story short, I thought about it for a few days after it was offered and decided I had to do it. As I have no idea if this could turn into something I might more regularly do (please inquire if you are interested for terms), many of the details below will remain vague. The group consisted of Jeff, Suzanne, and Diane, and featured two guest appearances by Gail Crowther. I was put at ease by Jeff's comment that I had "already forgotten more about Sylvia Plath than they will ever know". While that might not necessarily be true, the chance to bring people to Plath sites and present them in a way that was meaningful to me made this the opportunity of a lifetime. I have long found that by seeing the places where Plath lived and about which she wrote has a profound and deep impact on my understanding her of life, journals and letters, and creative works. Throughout the tour we were able to read selected Plath poems which were about a specific place. Overall the aim was to bring Plath's England to life through the words she wrote in poetry, prose, letters, and her journals. Was it successful? They did not ask for a refund so I hope so! On Saturday the 8th we "did" Plath's London. Now, London is massive and Plath's travelings around it from 1955-1957 and 1959-1963 was rather far reaching, so I spent several months reading primary sources, her creative works, and biographies to come up with a nice, tight and cohesive walking tour. The first day of the tour lasted from about 11:30 to 5:30 and included lunch and a pint at The Lamb, a pub near 18 Rubgy Street, and a pint at the French House (formerly the York Minster Pub) on Dean Street, where we were able to both drink to The Colossus and escape a downpour of rain. During that downpour, my wife captured the rainbow above, spanning London and the River Thames. Gail joined us for the first hour or so of the tour, which was wonderful as she and I were able to field questions together. Two minds are better than one, especially when one of those minds is as limited as mine. Of course we saw the "big" sites like 18 Rugby Street, the Church of St. George the Martyr (whose doors were open so we went in and then were promptly, politely, kicked out), 3 Chalcot Square, Primrose Hill, and 23 Fitzroy Road). But we saw oh so much more of Plath's London in and around Bloomsbury, Soho, Marylebone and Regent's Park. On Sunday the 9th, we took a taxi to Heathrow and picked up a rental car (driving in Central London was not an appealing option, even on a quiet, winter's Sunday morning). We drove from there to North Tawton through some of the most horrendous weather, particularly near Bristol. The bright side to this was the number of rainbows we saw as the sun and precipitation were in constant battle. However, by the time we approached the A30 at Exeter, the skies were bright and the sun out. Upon arriving in North Tawton, we went and had lunch at the White Hart on Fore Street, who whilst only serving Sunday roast accommodated my vegetarianism and presented me a colossal plate of delicious chips. The White Hart was a pub Plath would have known, especially as she likely knew the people that ran it. In her story "Mothers", the main character Esther attends the mothers union meeting with "Mrs. Nolan, the wife of the pub-keeper at the White Hart" (Johnny Panic 2008, 11). After lunch, the weather got bad for a few minutes before turning fair again, we went down to the River Taw and then back up into the town centre to see the church, Court Green, and a lot more. Plath vividly captures the people she inhabited North Tawton with in her journals and it is like stepping back in time in some ways, having Plath's words, knowing where she went, and seeing that much is unchanged. In a letter to her brother, Plath described their life in the early days at Court Green as "primitive", and throughout the spring she discusses the weeding and planting that she and Hughes were doing. The property now is so lovely, and while she had only such a short amount of time there, I like to think she paved the way for its current appearance. We stayed the night at the ancient Oxenham Arms in nearby South Zeal in Dartmoor, which is a very fine inn with comfortable rooms, excellent food, drink and staff, and in a stunning Devon setting. 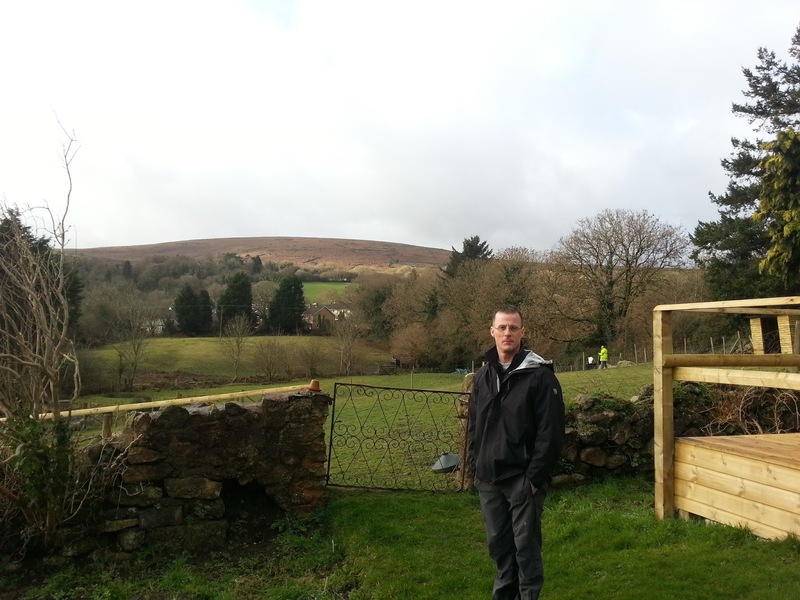 Perhaps the most wonderful things happened in North Tawton. While I was disappointed the church was locked up (I have heard a rumor that "inside the saints will all be blue"), when we were leaving the churchyard through the Lych Gate, we happened to look toward Court Green and saw that the moon had risen and was quite visible above the Yew tree. I thought of Plath's "The eyes lift after it and find the moon." 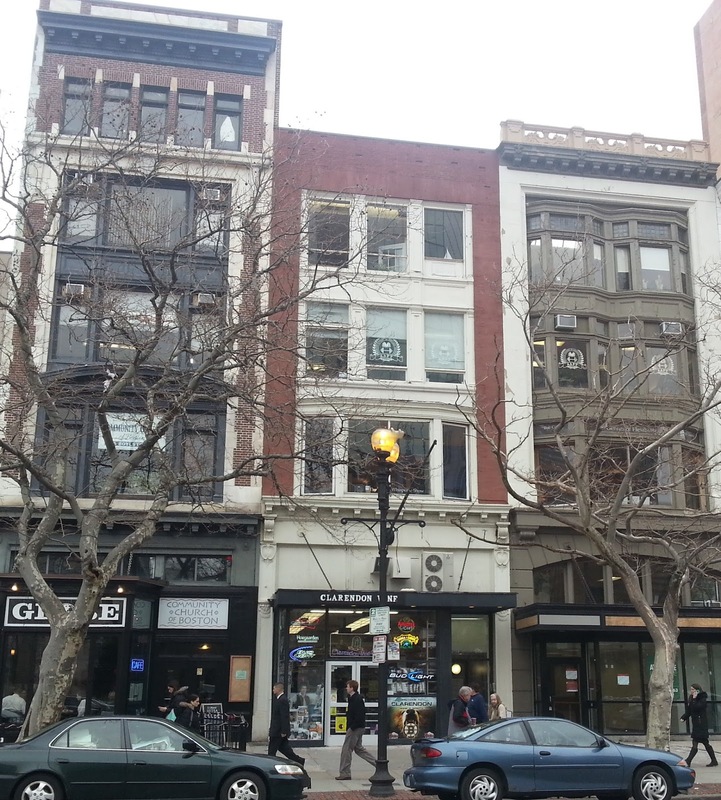 Of course the context of us standing on Market Street looking east was all wrong. Plath's study windows look west towards the Yew tree and south towards Dartmoor (she could probably see the elm trees in the southeasterly), so in the poem she sees the moon setting, rather than rising as it was when we saw it; but it was still terrific to see the moon and the yew tree together. There was also a rainbow over Court Green during the afternoon, too, but none of us were able to get cameras out to capture it. Monday the 10th, we left South Devon after a filling breakfast and drove to Heptonstall in Yorkshire, though first we stopped at our lodgings in Hebden Bridge to drop our bags and collect Gail Crowther. The dichotomy of scenery between Devon and Yorkshire is sharp; an ocular culture shock. The weather was again fine and sunny, so we went up to Heptonstall immediately as the forecast for the 11th was less friendly. The group was completely flexible to my whims and decisions based on things we could not control such as the weather, traffic, and the like. It was a good thing we went up when we did as the forecast held true. We walked through the old church of St. Thomas à Becket, saw Plath's grave and stayed there for a while, and then passed through the village to see The Beacon, and then retired to the Cross Inn for pints and to soak up the heat from their warm fire. On Tuesday the 11th of February the weather was pretty foul. We went up to the grave in the cold, miserable rain to pay our respects. Afterwards, we drove to Haworth, a town which Plath visited a few times on visit to the area. The moor top drive was quite dramatic, as we rose and rose in elevation the temperature collapsed and rain turned to snow, which made for stunning scenery. The Brontë Parsonage and gift shop were both close for renovations, which was poor timing -- on their part! However, we were able to walk around the St. Michael & All Angels Church and visited several local shops. We read Plath's "November Graveyard" as this was the churchyard she writes about in that poem (early typescripts called the poem "November Graveyard, Haworth"). After this, we drove Gail back to Hebden Bridge, had lunch, and then began the long drive back to return the rental car. A fantastic dinner that night at Manna on Erskine Road in Primrose Hill concluded a successful tour. This was an aggressive tour and sadly did not include Cambridge, which may be the only other place with a really deep Plathian connection other than satellite places she visited for an afternoon or a day such as Oxford, Stonehenge, Hartland, Cheltenham, Whitby, and Bangor, Wales, among others. All photographs are copyrighted by the photographer and may not be used without their permission. How Rare is Sylvia Plath's The Colossus (1960)? A couple of years ago, I learned and reported that the first edition print run for a Victoria Lucas Bell Jar (Heinemann, 1963, pictured right) was 2,000. This is an interesting number to know because it helps us recognize the scarcity of Plath's novel. The number was described in Stephen Tabor's incomparable Sylvia Plath: An Annotated Bibliography as a "token quantity". Recently I learned from a bookseller in England, Giles Bird O.B.E. 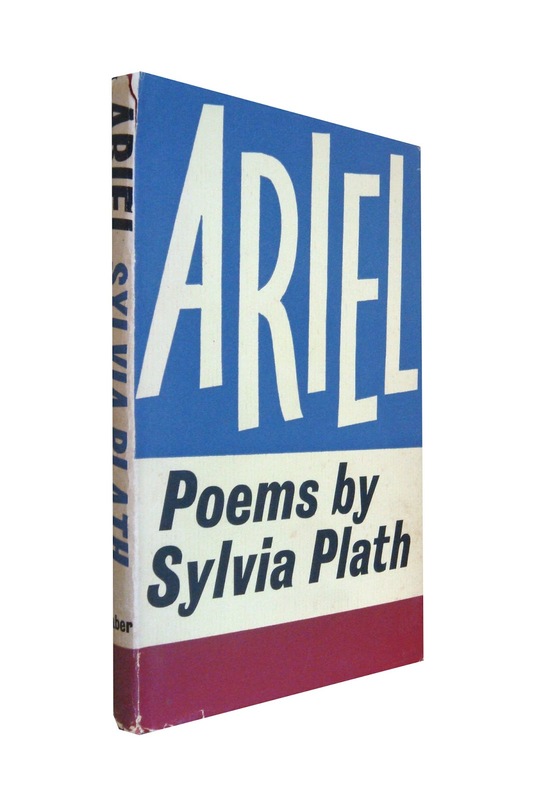 of BAS Ltd. in London, that the first printing of Plath's 1960 volume of poetry The Colossus was a number far less than that of The Bell Jar. (He in turn, it should be said, was provided with the figure by the amazing Jean Rose, an archivist at Random House Group UK which holds Heinemann's archives.) Anyone want to take a guess as to the number? My first reaction was shock. However, shock might have been a premature evaluation. After all, Heinemann was not normally a publisher of poetry. And in light of the fact that they were more known for their fiction -- Heinemann were publishers, according to Plath, of "Somerset Maugham, Evelyn Waugh, DH Lawrence, Erskine Caldwell" (letter to Aurelia and Warren Plath, 11 February 1960) -- perhaps the qualification for the size of the print of The Bell Jar as a "token quantity" of 2,000 is not too low after all? That is, perhaps it was a "token quantity" compared to the normal print runs of those well-known novelists. Regarding Plath's assertion that Waugh was a Heinemann author, Bird wrote me that "Sylvia got it wrong about Evelyn Waugh having Heinemann as his publisher. He didn't. His UK publisher was pretty consistently Chapman & Hall. Heinemann only brought out a few Waugh reprints in the late 70s - which Sylvia never saw. However, in addition to the other great writers she listed, Heinemann were Graham Greene's publisher from 1929 up until 1961." Oh, I still have not mentioned how many copies were in the first print run of The Colossus, have I? Frankly, I cannot get over it. Plath was disappointed that her book, which although it had almost all of the poems in it published individually, won no prizes and was hardly promoted in England. 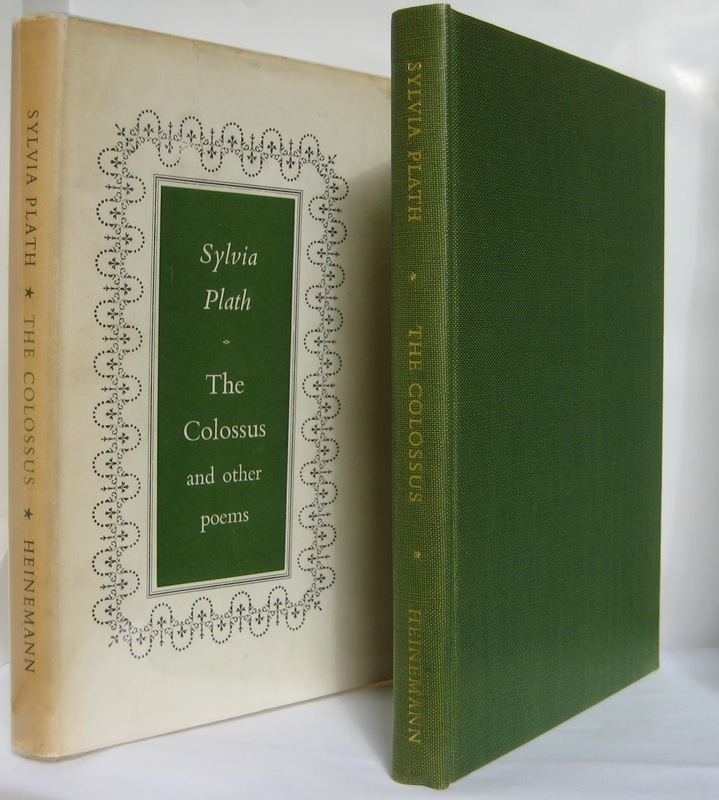 Just after publication in October 1960, Plath wrote resignedly to her mother and brother, on 19 November 1960 to be exact, that perhaps The Colossus would make "a nice gift book". Indeed. Anyone lucky enough to own the book now is quite lucky! Still waiting for the number of Colossi? Read on, please. 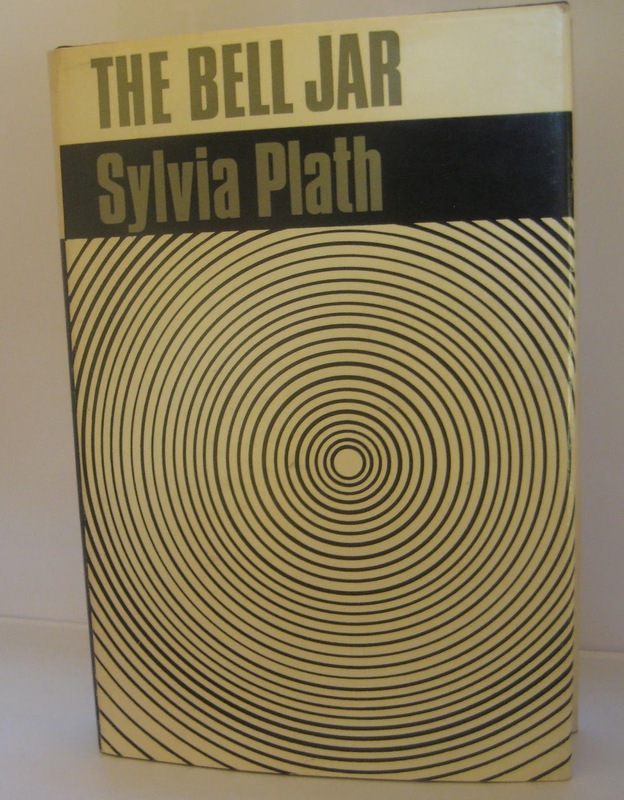 Because I love Plath's books and enjoy seeing them, reading them, drooling over excellent quality first and limited editions at book fairs and in rare book libraries, it seems appropriate to list five current titles for sale from BAS Ltd., which all seem accurately described, affordably & competitively priced, and in fine condition. 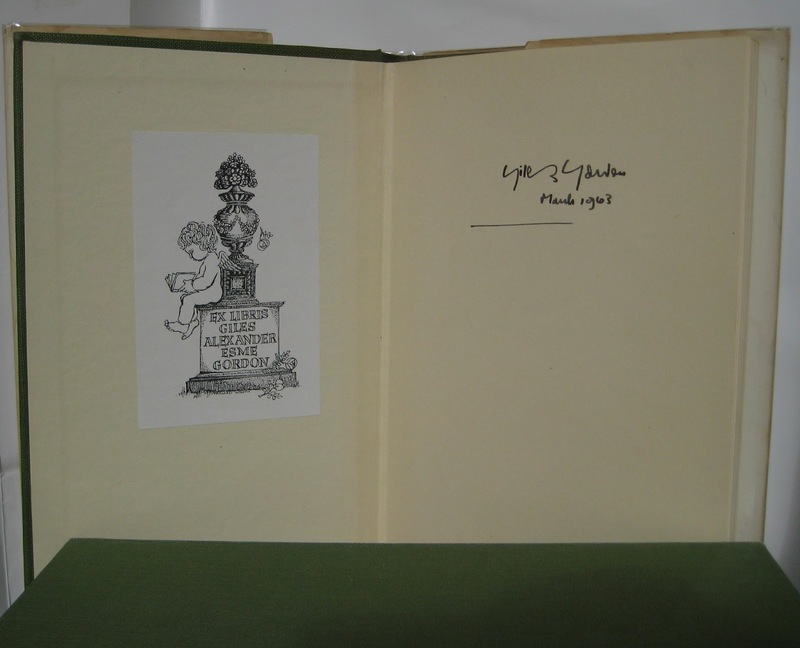 London; Faber; octavo; first impression of first edition of author's celebrated and influential second collection of poetry, published posthumously, collated and edited by Ted Hughes, in a small printing of 3100 copies preceding the American edition by a year. 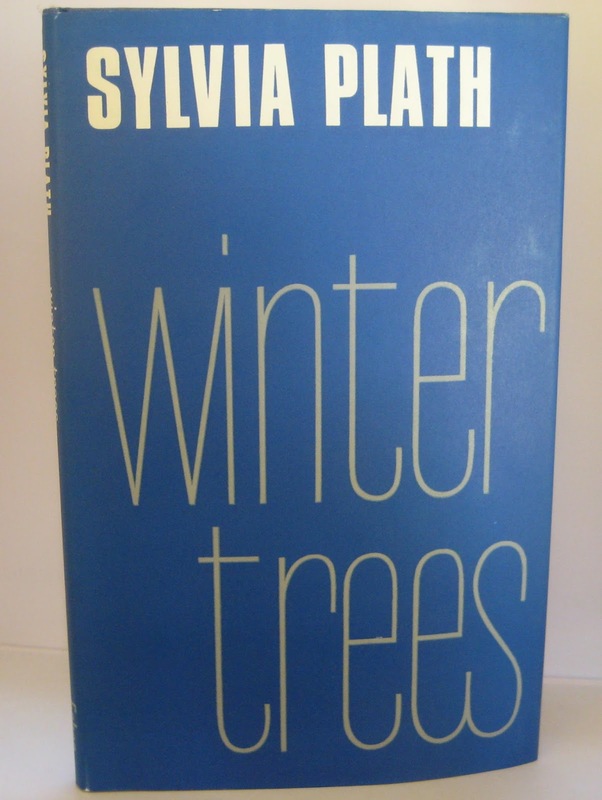 London; Faber; octavo; first printing – only 3000 copies in the run – of the first Faber sub-edition (the first with the author explicitly identified in titles) of Sylvia Plath's only novel. London; Heinemann; octavo; a first impression of the very scarce first edition of Sylvia Plath's first published collection of poetry: the only book published under her name in her lifetime, and then at the age of just 28. Published on 31st October 1960 [at 15/-] in an edition of ONLY 500 COPIES. (viz. Heinemann Archive/Random House Librarian's confirmation). "I am touched that my publisher got them out in my birthday week after I told him how superstitious I was. I hope the two printing errors towards the end don't upset you as much as they did me! I've marked the corrections in your books and am appalled that after several proofreadings I was guilty of letting them get through, but Ted has reassured me about them and you do, too. I am delighted with the color of the cover – the rich, green oblong, white jacket and black-and-white lettering – and the way the green cover inside matches with the gold letters. It is a nice fat book which takes up ¾ inch on the shelf, and I think they did a handsome job of it…"
500 copies! My my my. All links accessed on 1 March 2014.